PHD were official suppliers of Down Jackets, Down Sleeping Bags, Down Trousers and Down Mitts and Boots to the expedition. 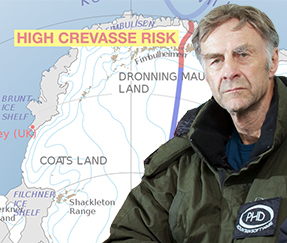 Expedition Organiser & Leader, Sir Ranulph Fiennes, said PHD's down clothing is "a keystone of our ability to mount this, the most difficult and ambitious polar challenge in history". We supplied Sir Ran Fiennes, Sir John Simpson, and Sir Robin Knox-Johnston with cold weather gear for their BBC TV documentary series, Three Dogs. Sir Ranulph, whose records have included making the first surface journey around the world's polar axis, guided the others on a week-long journey to the Arctic Circle in temperatures as low as minus -50C. All three were be protected by PHD gear on their journey including: Xero Jackets, Xero Salopettes, and Extreme Balaclavas. In further programmes John Simpson taught his team-mates to file news reports from a war zone and Robin Knox-Johnston led a voyage around South America's dangerous Cape Horn. The series was broadcast on BBC2. We supplied Ran with the down jacket, suit and sleeping bag he used on his Everest expeditions. Ran called the gear "superb". Over the course of the expeditions Ran raised over £4 million for Marie Curie Cancer Care.